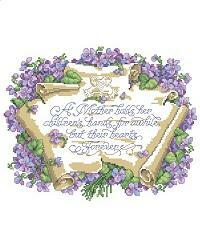 A mother holds her children’s hands for a while but holds their hearts forever. A beautiful verse nestled among the violets. This sampler would make a lovely gift from a mother to give to her child who is leaving the nest for the first time. Project Size: 12w x 12h"